This is Day 2 of Project 365, where I will take a photo a day for an entire year. So tonight we went to P.F. Changs for dinner after a photo shoot with a client. We had never been before despite them being in town for years now and located only a few blocks from our house. The place always looked interesting with it’s giant majestic horse guarding the front door and it’s water feature along it’s backside. The decor was quite nice. We had the kids with us so we couldn’t check out the bar area. We ordered a selection of appetizers including Changs Chicken Lettuce Wraps which were spiced chicken in lettuce cups. These were absolutely fantastic! Seriously, I couldn’t stop eating them. We also ordered Crab Wontons, Pan-Fried Pork Dumplings, Steamed Pork Dumplings and Crispy Green Beans which were similar to tempura fried. 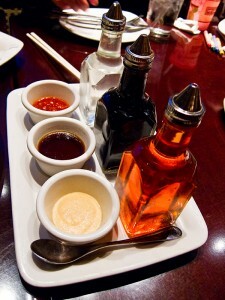 We were served a dish of a variety of sauces which is the photo for Day 2. I called it triple sauce because of the 3 small bowls which we mixed into one and then added a bit of spicy oil and soy sauce. It was really good. For dinner I enjoyed a Ground Chicken and Eggplant dish that had a bit of a kick to it but not too bad. It was really delicious. We will definitely go back as we were so full that we had to pass up dessert. Next time we will start with dessert and finish with the appetizers. Just looking at that picture made me start craving the lettuce wraps. Now I know what I’ll be making for dinner! @Gail – yeah those wraps are something else. I can see me investing plenty of money in a habit of eating them frequently.